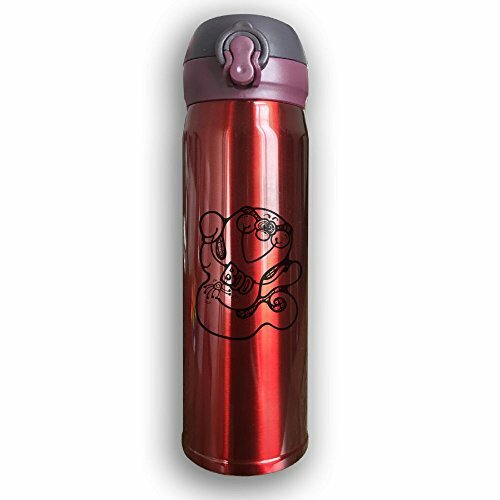 Cupcari Stainless Steel Water Bottles Are Made Of Medical 304 Stainless Steel + High-grade Electroplating Environmental Protection Paint + Food Grade PP Material + Food Grade Silicone Seal Ring. Unlike Plastic Water Bottles Or Single Wall Stainless Bottles, Cupcari Water Bottle Will Keep Your Beverage Of Choice At Your Preferred Temperature For Hours, Whether You Choose Hot, Cold Or Room Temperature Liquids. The Water Bottle Has Lightweight Design, Perfect For Your Gym Bag, Car, Bicycle And Backpack To Enjoy Your Long Hikes, Trekking, Hot Yoga Class, Long Load Trip, Or Any Other Outdoor Activities. Even When Filled With Ice, The Exterior Of Your Water Bottle Will Never Leave A Puddle On Your Desk, Drip On Your Shirt, Or Sweat In Your Bag. Tea Separated Design, 304 Food Grade Stainless Steel Fine Filter Hole Close Filter Separation Of Tea Residue, Drink More Intimate, Cup Design, Washable And Convenient. Fashion Design, Looks Cool, You Will Love It And Can Be Given As A Gift To Family Members, Friends And So On. Food Grade Stainless Steel: Double Vacuum Stainless Steel Insulation Mug, Using Shatter Proof 100% Stainless Steel Material Inside. If you have any questions about this product by Cupcari, contact us by completing and submitting the form below. If you are looking for a specif part number, please include it with your message.